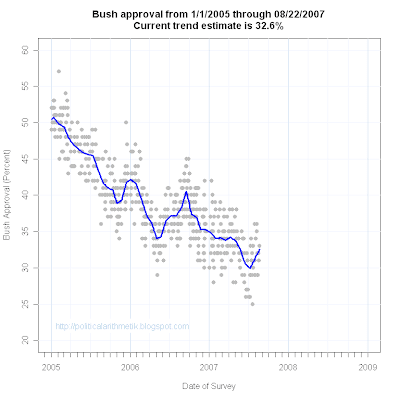 There have been three new polls since my last update of approval of President Bush. The USA Today/Gallup poll done 8/13-16/07 found approval at 32%, disapproval at 63%. A Pew Research poll taken 8/1-18/07 got approval at 31%, disapproval at 59%, and the Fox News poll done 8/21-22/07 put approval at 33%, disapproval at 56%. With these three polls, the trend estimate is 32.6%, a small continued gain over the previous batch of polling. 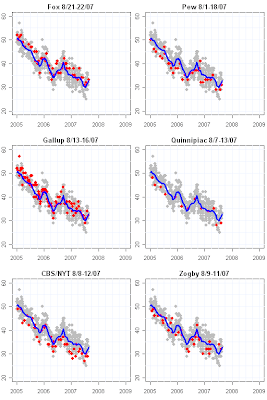 The plot below shows the six most recent polls in relation to the trend estimate. None of the recent polls qualify as outliers, with all comfortably within the 95% confidence interval. 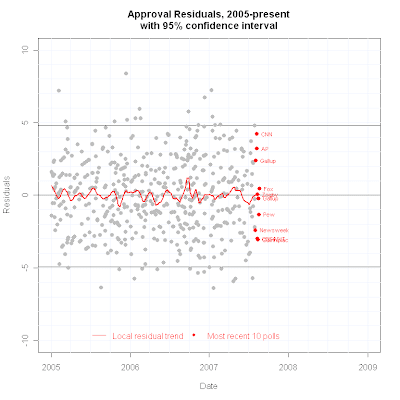 Does One Bad Pollster Spoil the Trend Estimate?